A: Our worship service follows a pretty regular order each week. There is a story time, prayers, sermon, offering is collected, and sometimes there is communion or baptism. We sing contemporary hymns as well as the “oldies”. We have a large screen to project words and images. A: Clothes ;) Come as you are, our dress is casual and we encourage everyone to wear clothing that makes them feel comfortable. Q: What do you offer for Children Sunday mornings? A: I am glad you asked! Children are an important part of our ministry here at Woodlawn. Most Sundays, we offer Sunday School for children 2 years old – Grade 5. 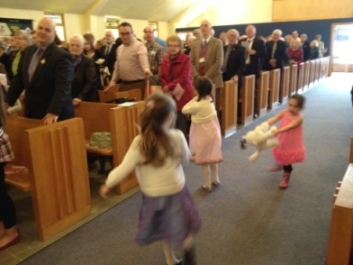 They join with the entire church family for the first part of the service and then go downstairs for Sunday School. Youth (Grade 6 and above) go to Youth Group in our Heritage Building (White Church on same property) Sunday AM at the same time. Children and youth explore and develop their relationship with each other and God through activities & and discussion in ways that are relevant to their lives. A: 54 Woodlawn Rd, Dartmouth, Nova Scotia (on the corner of Woodlawn Road and Mount Edward Road). Bus routes #62 & 72. A: Our services are every Sunday at 10 AM. They usually last 1 hour and 15 minutes and are followed by a fellowship time to meet folks and share tea, coffee and a snack. Q: Where do I go when I arrive? A: When approaching our facility you will be greeted by some friendly faces to welcome you and answer any questions you might have. Enter through the big doors at the front of the church, or the glass doors in the new accessible addition. You will be welcomed into the sanctuary and given a bulletin (order of service). Sit anywhere you like! As creatures of habit, many people sit in the same place each week…. But be assured… there is no assigned seating! There are hymn books in the pews but the words to all hymns and any unison readings will also appear on the screen. Do not be shy to introduce yourself and ask questions. We would love for you to join us to hang out and meet people after the service. Q: Will I feel welcome at Woodlawn United Church? A: We have made our church wheelchair accessible and want to invite ALL people to be a part of our church community. We extend a special welcome to those who are single, married, divorced, straight, gay, filthy rich, dirt poor. We welcome you if you find reading challenging, stairs difficult, singing in key impossible. We welcome you here if you’re “just browsing,” just woke up or just got out of jail. We don’t care if you have attended church every Sunday since you birth or haven’t been in church since little Joe’s Baptism. We extend a special welcome to crying new-borns, those who are over 60 but not grown up yet, and to teenagers who are growing up too fast. We welcome hockey moms, stay-at-home dads, starving artists, tree-huggers, latte-sippers, vegetarians, junk-food eaters. We welcome those who are in recovery or still addicted. We welcome you if you’re having problems or you’re down in the dumps or if you don’t like “organized religion.” We’ve been there too. We offer a special welcome to those who work too hard, don’t work, can’t spell, or those who are inked, pierced or both. We offer a special welcome to those who could use a prayer right now, had religion shoved down their throat as a kid or got lost in traffic and wound up here by mistake. We welcome tourists, seekers and doubters, bleeding hearts … and YOU! Q: What makes Woodlawn United Church different? A: We are the “church on the corner” who strives to be a central part of the community. We host very diverse programs for the community ranging from martial arts to alcoholics anonymous, scouts and guides to vacation bible school, card games for seniors and Christian education programs. We try to reach out to those in need as well, both in our local and global communities. We are striving to be inclusive and accessible to all. This includes working to make our buildings barrier free (we have an elevator), creating a place in our worship space for infants to play and their parents to sit, and performing marriages for people who love each other, regardless of their genders. We want to invite you to join us.